Every year, the Pacific Beach Coalition recognizes the contributions made by our thousands of Earth Heroes during Earth Day of Action. Volunteers receive a personalized “Star of the Sea Award” for taking action to protect and preserve our coastal environment. We also recognize the dedication of one special Earth Hero who receives the Cedric Collett Unsung Earth Hero Award. 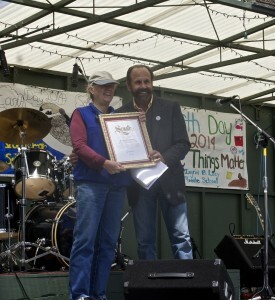 In 2014, the year the Pacific Beach Coalition achieved a milestone by marking the 10th Anniversary of Earth Day of Action, we formally established our annual “Unsung Earth Hero Award” in the memory of Cedric Collett – one of the most beloved, inspiring, genuine and committed members of our Earth Hero team who, for more than eight years, exemplified unwavering dedication to the preservation of Pacifica’s coastal habitat through his trademark caring spirit and eagerness to take on daunting projects and the ‘heavy lifting,’ and his innumerable daily cleanup actions that made a significant mark on Mother Earth through his devotion to our community and environment in Pacifica. 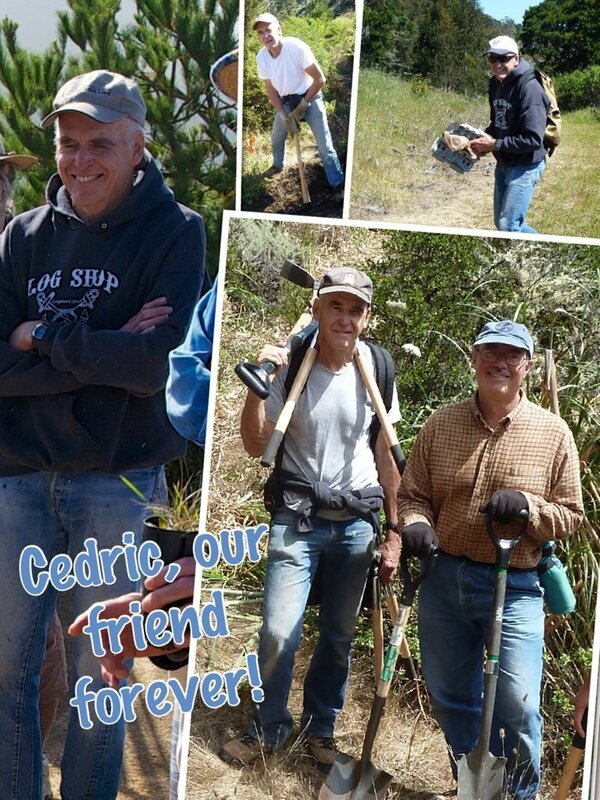 Every April, the Unsung Earth Hero Award is given to a recipient who demonstrates Cedric’s traits as a devoted environmentalist, and a willingness to share time, talent, knowledge, insight and wisdom on behalf of our environment and ocean. 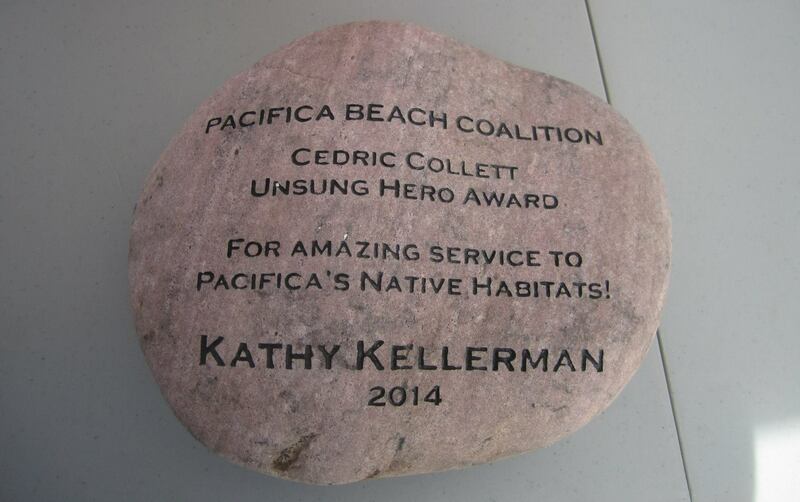 In 2014, Pacifican Kathy Kellerman was our first Unsung Earth Hero Cedric Collett Award recipient because of her steadfast long‐standing devotion to preserving the native habitats and biodiversity of our coastal landscape to protect wildlife, our ocean and our beaches through her tireless collection, propagation and nurturing of native coastal plants from ‘seed to sand and land’ during monthly hands‐on habitat restoration events throughout Pacifica at Linda Mar Beach, Pedro Point Headlands, and Rockaway’s switchbacks; and for her on‐going contributions to educating youth at Ocean Shore School, and to the beautification of Pacifica’s Community Center. In 2013, in partnership with Pacifica Land Trust, we recognized the contributions of Mitch Reid with the opening of the Tom Lantos Tunnels. It is our dream to create a scholarship fund to award to young Earth Heroes so they may attend ocean-related and/or environmental education programs in the future. 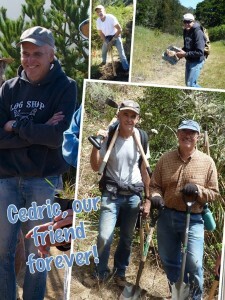 If you would like to make a donor-directed contribution to the “Unsung Earth Hero Award” in the memory of Cedric Collett, please contact us directly for more information.